I had just finished preparing and polishing a devotional message for one of the online classes offered at my university when, on my way home, I encountered a familiar on-campus student who happened to also be taking online classes. Out of curiosity, I asked if he was reading the devotional section of his class. He answered “Uhmm . . . sometimes . . . but, honestly, I usually skip it because I want to go straight to the week’s topic . . . .” His response was discouraging to me, especially after all the effort the professors put into integrating faith in the online classes through carefully planned devotionals. This encounter led me to ask: How can teachers of online classes make class devotionals more engaging for online students? Undoubtedly, creating a God-centered worship experience in an online classroom can be very challenging. Without direct teacher guidance, how can students be led to experience true worship? A common practice is the creation of a virtual space in their online course where teachers can post inspirational quotations, Bible texts, or inspirational thoughts. While these posts on the course Webpage help create a Christian atmosphere, they can also appear to be mere add-ons, particularly when they are unrelated to the course content. Students can skip them in order to go straight to the course requirements and activities. Even if they are read, there is no guarantee that the students will interact with the message. A devotional message that is unrelated to the course topic will provide little support for a biblical approach to the lesson. The online environment has unique advantages that can enhance a well-planned devotional activity. For example, the asynchronous component (activities and discussions that take place outside of class time) of online devotionals gives students ample time to reflect on the message, share thoughts with one other, and build relationships. Teachers can also create activities related to the devotional message without the time constraints or space limitations. 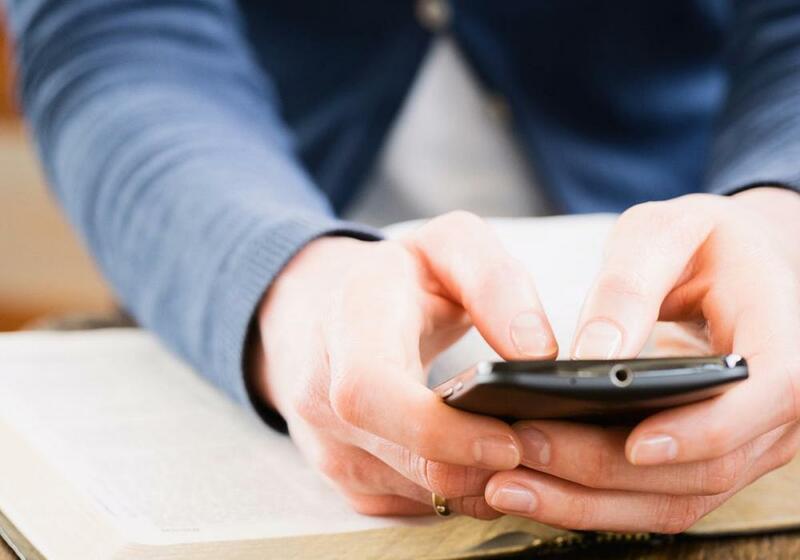 Technology can leverage the limitations caused by distance and assist teachers in creating successful devotionals in the online environment. The following principles can help ensure that online devotionals serve their purpose. Rarely will all of them be used in one activity, but it is best to consider all of them when preparing devotional plans for the entire course (whether a quarter or semester). Principle 1: Devotionals must be Christ-centered and seek to lead students to an active worship experience with God. Design implication: A read-only message is not enough. Be intentional in leading the students to reflect on the message either through an accompanying discussion forum or a reflection journal. If possible, give selected students an opportunity to lead a class devotional. Principle 2: Devotionals must encourage students to share their faith or strengthen one another’s faith in God, thereby supporting the development of a faith community. Although faith develops from a personal relationship with God, the value of a nurturing faith community in a school setting is valuable for students’ faith development. Design implication: Encourage interaction among the members of the class through discussions or simple group activities that accompany a devotional message. Principle 3: Devotionals must provide students with opportunities to practice Christian values or lifestyle and engage in mission. Design implication: Create student activities related to the message. Discussions may be interspersed with other activities like personal applications, interacting with the students’ local communities, and the like. Principle 4: The devotional message should be part of the complete lesson package. As a beginning activity, it can serve as a vantage point in incorporating the lesson within an Adventist worldview. Design implication: Prepare devotional messages connected to the course topic. Principle 5: Devotional activities should be varied and designed to create excitement and surprise with the goal of fostering student engagement. Design implication: Vary the interactive components, presentation style, and media. Students may be asked to interact with the message, with a Bible text, with one another, or with significant social issues. Interacting with classmates may be done at the class level or school-wide in all distance or online courses. The message may be teacher-led or student-led. Instructors may also choose to include in the syllabus specific guidelines for student-led devotional presentations. Presentation may be via text, video, or other media. Principle 6: A spiritual activity is more meaningful if it is voluntary. Participation in the devotional need not be graded unless it plays a significant role in the lesson outcomes. Active student participation results from active teacher facilitation and well-designed devotionals. Design implication: Encourage active student participation through engaging and well-planned devotionals. If teachers practice these principles when creating online devotionals, this will result in a variety of devotional experiences, making the devotional section of the online course one of the most exciting sections of the class, one that students will look forward to each time they log in. Creating devotional activities can be fun, and the task can be shared by teachers and students. Here are some examples of online devotionals, class-level and school-wide, that reflect the principles listed above. These are taken from actual fully online graduate-level courses at the Adventist International Institute of Advanced Studies (AIIAS), Silang, Cavite, Philippines. One of the goals of the course Teaching English to Speakers of Other Languages (TESOL) Methods in Speaking and Listening is for the students to practice speaking the English language. The devotional activities provide a good venue for students to not only take the lead in sharing inspirational messages but also for the teacher to observe students’ speech. In a recent class, students became actively involved in the activity as they took turns leading the devotional through video presentations. A seminary class in Hebrew used the online devotionals to show the value of learning this ancient language in order to better understand the Bible. This generated active class discussions. As a result, students developed greater appreciation for their lessons. Public health deals with community service through promotion of preventive health practices and environmental protection. It is, therefore, fitting for teachers in this field to develop devotionals that call for students to go out to the community to apply what they have learned. The online class Principles of Environmental Health used a devotional activity to raise the students’ awareness of their responsibility for the environment. Preparing a devotional message that is related to technical topics in business classes may be challenging. But devotionals can help clarify biblical principles for business practices. Thus, a class in Marketing Management made Jesus the model in supplying the needs of human beings. As we study this week’s lesson, may we value the importance of building relationships that inspire people to be the best they can. This week, find at least three friends you want to influence for good. 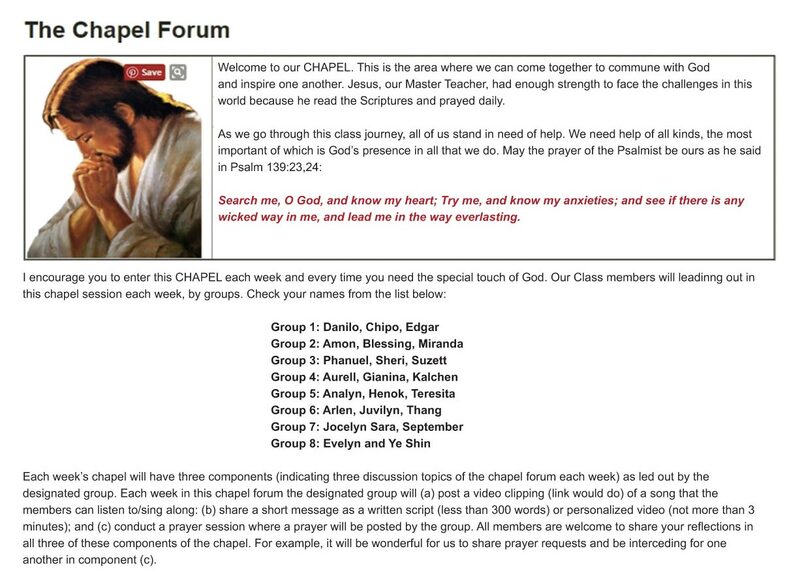 Post their names in the Devotional Forum, and we will pray for them. This helped the students to become more aware of their own influence and their responsibility for others. Praying for others was also a positive experience. Below are sample testimonies of students in the class. by Chipo Gwizo—Tuesday, 2 August 2016, 4:56 PM Amen. It is very encouraging to know that someone is praying for you, especially your professor. As teachers we need to pray for our students and for one another. Re: You are not an inconvenience! by Ebenezer Danquah—Wednesday, 3 August 2016, 9:41 PM Nobody is an inconvenience when we truly show love. Thank you for instilling this in the class. Bible text(s)—The students study and meditate on Bible verses related to the class topic. Values—Bible-based values related to the lesson are emphasized and discussed, either through case studies or illustrative stories. Community (outreach, mission)—As part of the devotional message, students are asked to go out to the community, meet people, and engage in mission-oriented activities. Testimony—Class participants share personal testimonies. Prayer—Devotional hour can be compared to a Prayer Garden, where the focus is communicating with God. Participants pray for and with others. Music—Devotional time is centered on singing songs of praise and thanksgiving that focus the mind on God. Students may share favorite songs to be sung singly, in groups, or as a whole class through videoconference (this can be accomplished during synchronous meeting times, with or without accompaniment). Inspirational stories—The devotional message may be based on an inspirational story that becomes the basis for reflection. Object lesson—Each member of the class can show objects (photo or video) and discuss their biblical significance or any lesson that can be learned from them. In addition to the regular devotionals, teachers can create special spiritual events to give their students additional opportunities to experience devotional life in a larger faith community. These include the online spiritual retreat and the online week of prayer. • Online Spiritual Retreat. A spiritual retreat is commonly required in the AIIAS seminary class Ministry and Spiritual Life in order to provide students with an opportunity to experience spiritual growth and renewal. Achieving the same goal in an online environment is obviously challenging; but it is possible. First of all I have to say this retreat was wonderful. It is the first time I have [had] a retreat for myself. I held retreat for young people, for Sabbath school classes, for elders, and church members. I conducted a day of prayer and fasting. For the first time, for as long as I can remember, I was “at the center’ of a retreat. I was not talking to people, showing them God’s ways. But during this AIIAS retreat I was face-to-face with God, listening to Him. I learnt that as pastors and administrators we need to spend time with God even and especially when we are busy. I was not able to plan for this retreat long before because I have a very crowded schedule; [I] made a plan for at least six months before [and] was able to spend six hours with God. I spent time telling God not about people or about church business, but about myself. I took time to open my heart to him, telling Him about my present, asking Him to scan my life, to visit every content of my mind, and asking Him also to control my entire life. • Online Week of Prayer. The interactive online week of prayer aims to provide online students with a focused worship experience outside their academic subjects. Just like the one held on campus, it consists of daily messages, singing, and prayer sessions. It also features counseling, sharing testimonies, and prayer circles. To make sure participants understand the message, the teacher creates a discussion forum where they can talk about the message rather than just read it or listen to it. Since participation is voluntary, the program is carefully designed to make it as attractive, personal, and inclusive as possible for all students, regardless of their religion or cultural background. Topics are carefully chosen so that even non-Adventist students—Protestants, Catholics, and Muslims alike—feel comfortable participating. Figure 1 on page 38 illustrates the topics chosen by AIIAS Online during the past three years. The people designing the program set out to create a week of prayer that would have a personal impact despite the absence of face-to-face contact; a program that was inclusive for those of other faiths and yet remained truly Adventist. Speakers and prayer leaders were invited from around the world to represent the geographical areas where the students lived. To ensure that the students were an integral part of the program, they were asked to serve as facilitators in the discussions, thus making the week of prayer not just for them but also by them. Indeed, there is no limit to planning and creating engaging online devotionals. As Adventist educators teaching in online settings, creating a learning environment that “brings the student into close relation with the Teacher sent from God. . . .”9 is part of our calling. Creative online devotionals must be Christ-centered. Devotionals in online courses can encourage students to not only share their faith, but also put their beliefs into practice in ways that help them engage in mission. Creative online devotionals should complete and complement the lesson plan in an intentional, integrated way. Varied activities designed to create excitement and engagement students will enrich the worship experience and help build and strengthen interaction in both synchronous and asynchronous environments. Leni T. Casimiro, PhD, is the Director of AIIAS Online at the Adventist International Institute of Advanced Studies (AIIAS) in Silang, Cavite, Philippines. With more than 16 years of experience in the field of online education, Dr. Casimiro has done extensive research in designing online courses, with specific emphasis on faith integration and mission-oriented course designs, student engagement, online teaching strategies, quality standards, and learning analytics. She also serves as Associate Professor of Curriculum and Instruction, and Online Learning at AIIAS. (January-March 2018): 35-39. Available from https://jae.adventist.org/en/2018.1.7. Ellen G. White, Counsels to Parents, Teachers, and Students (Mountain View, Calif.: Pacific Press, 1913), 422. __________, Child Guidance (Washington, D.C.: Review and Herald, 1954), 293. 2 Corinthians 10:5 NKJV. New King James Version (NKJV). Scripture taken from the New King James Version®. Copyright © 1982 by Thomas Nelson. Used by permission. All rights reserved. Ellen G. White, Mind, Character, and Personality (Nashville, Tenn.: Southern Publishing, 1977), 2:441. __________, Counsels to Parents, Teachers, and Students, 452. __________, Signs of the Times (August 26, 1886): par. 6. __________, Evangelism (Washington, D.C.: Review and Herald, 1946), 148. All names, photos, testimonies, and images used with permission. White, Mind, Character, and Personality, 2:447.